Port Blair, Sept. 11: The Andaman Nicobar Pradesh Congress Committee organized a Dharna and Road blockade (Rasta Rokho) at Dhanikadi junction from 5.30 a.m today supported by other political parties to invite the attention of the Administration towards the dilapidated and unsafe condition of the road from Shippighat junction to Dhanikhadi junction and in general the National Highway No.4 (ATR). A large number of residents from the adjoining villages and party workers actively participated in the Dharna. 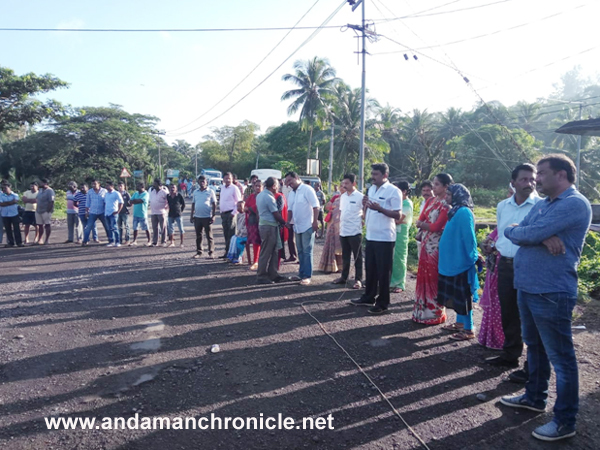 Addressing the protesters and commuters, Kuldeep Rai Sharma, President, PCC said that the Andaman Trunk Road which is main support system for transportation of men and material has turned into a major annoyance for the people of South Andaman and Middle & North Andaman districts. He said, commuting in the ATR recently notified as National Highway- 4 has become a matter of “Great Inconvenience” in everyday life of the islanders. Kuldeep further said that the dilapidated condition of the road with huge potholes on almost entire stretch of ATR give tough time to the commuters, while bumpy rides on the road leads to bad driving experience even resulting in accidents. For local residents, the condition of the road is a continuous pain and it effects people from all walks of life. Due to bad condition of the road the patients, students and elders are the worst suffers. The dilapidated condition of the road coupled with ever increasing high cost of fuel has increased the running and maintenance cost of vehicles moving on ATR. The tourists travelling on ATR carry bad impression and experience back home. The PCC President said that even after approaching the Administration and the concerned authorities innumerable number of times and being unheard, the Congress party is forced to stage this road blockade & dharna to invite the attention of Administration, the NHIDCL for immediate maintenance and repair of ATR. The dharna was also addressed by Smti Shanta Singh , Mohd. Safique, Subir Chander, Sahay Mary, Shri N.N. Nag, and many others cutting across the political boundaries. All the speakers in their address highlighted the difficulties being faced by the villagers due to the worst condition of the NH-4 (ATR) and demanded immediate action for the repair and maintenance of the existing road. Sensing the gravity of the situation, the contractor from the mainland M/s. Jandu Construction Company who has been awarded with the work of overlay of Road from Mithakadi junction to Shippighat junction assured in writing to make the road in motorable within 10 days with over laying of road to be taken up immediately. On the basis of assurance given by the contractor in the presence of officers of the Administration, the dharna and road blockage was called off. The Deputy Commissioner, South Andaman has also called for a meeting with PRI members of the Mithakdi, Shippighat, Humfrygunj and the adjoining areas to resolve the issue in presence of the NHIDCL and the contractor.